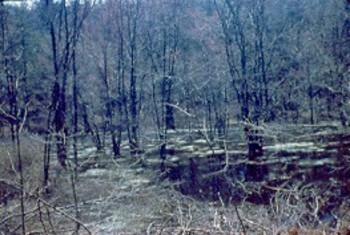 In 1959 or 60 when I was a Virginia state wildlife biologist working on a cooperative project with the US Forest Service I was told by my supervisor that money had become available to do the Shepp pond project. It was a project he had proposed several years prior and finally authorized and funded. I was to supervise it, it being on my district, part on the then-Pedlar Ranger District near Glasgow Virginia. The site was a high elevation marsh (a half-acre as I recall it now) near a small "wildlife clearing" in the forest. We enlarged such clearings and turned them into pastures for deer and for wild turkey nesting areas in the borders. We often built small (bull-dozer blade-wide "waterholes" (temporary water supplies) at the sides of such areas to provide water for various wild fauna. In some areas we built small ponds for fish and wild fauna. I destroyed the marsh and turned the area into a pond with an earthen dam. I knew I had done something wrong. I did not know what. I discussed my misgivings but was not opposed to the project. I did not know enough to be strongly for or against it. Soil conditions were right for the project and there did not seem to be permanent water available for fauna. It was completed. Shortly thereafter I asked for a leave of absence for graduate school. I knew I was not the ecologist I needed to start becoming. I could not explain the indentation in the land, the nature of the soil, the presence of the stems (there had to have been a dry period for germination). I knew there were plants with which I was not familiar but their sources unknown. I did not know how to age the pond or appreciate the historical record its pollen layers held. I knew of its amphibians but only later learned of its great richness for plants as well as wild fauna. The lessons: learn the area well (the inventory); value it well; look for options (perhaps another pond nearby could have produced permanent water for a lower price and saved the marsh); question "the resource" (perhaps this was a remote area never again seen by more than 5-6 people, perhaps not unique); learn the importance of free water to each species, for some have no needs, others have essential life-cycle adaptation; appraise objectives (deer, black bear, wild turkey and other game or wild fauna for gaining and holding ecological richness? ); ponder future values (could amphibian and songbird richness some day be more important to more people than more deer? ); learn the history of the site, e.g., in the growth rings of the shrub stems, fires, seed rain; and learn how to articulate the value of such areas and investments in their protection. And then develop the means to protect them and manage them for the desired status if that is the decision. Such sites will be changing (succession or transition) and later stages may not be as desirable as the present one. Some day I may return to Shepp pond to learn more. I do not have time for another graduate degree.